Assessment of carbon pools in semi-arid forests of India is crucial in order to develop a better action plan for management of such ecosystems under global climate change and rapid urbanization. This study, therefore, aims to assess the above- and belowground carbon storage potential of a semi-arid forest ecosystem of Delhi. For the study, two forest sites were selected, i.e., north ridge (NRF) and central ridge (CRF). Aboveground tree biomass was estimated by using growing stock volume equations developed by Forest Survey of India and specific wood density. Understory biomass was determined by harvest sampling method. Belowground (root) biomass was determined by using a developed equation. For soil organic carbon (SOC), soil samples were collected at 0–10-cm and 10–20-cm depth and carbon content was estimated. The present study estimated 90.51 Mg ha−1 biomass and 63.49 Mg C ha−1 carbon in the semi-arid forest of Delhi, India. The lower diameter classes showed highest tree density, i.e., 240 and 328 individuals ha−1 (11–20 cm), basal area, i.e., 8.7 (31–40 cm) and 6.08 m2 ha−1 (11–20 cm), and biomass, i.e., 24.25 and 23.57 Mg ha−1 (11–20 cm) in NRF and CRF, respectively. Furthermore, a significant contribution of biomass (7.8 Mg ha−1) in DBH class 81–90 cm in NRF suggested the importance of mature trees in biomass and carbon storage. The forests were predominantly occupied by Prosopis juliflora (Sw.) DC which also showed the highest contribution to the (approximately 40%) tree biomass. Carbon allocation was maximum in aboveground (40–49%), followed by soil (29.93–37.7%), belowground or root (20–22%), and litter (0.27–0.59%). Our study suggested plant biomass and soils are the potential pools of carbon storage in these forests. Furthermore, carbon storage in tree biomass was found to be mainly influenced by tree density, basal area, and species diversity. Trees belonging to lower DBH classes are the major carbon sinks in these forests. In the study, native trees contributed to the significant amount of carbon stored in their biomass and soils. The estimated data is important in framing forest management plans and strategies aimed at enhancing carbon sequestration potential of semi-arid forest ecosystems of India. Forests play a significant role in the global carbon (C) cycle and they store large quantities of C in vegetation and soil (Pan et al. 2011). For example, forests store 638 Gt of C in their ecosystem, with 238 Gt in biomass, which accounts for 80% of biomass C of terrestrial vegetation (FAO 2005). Arid and semi-arid regions cover approximately 47% of the earth’s surface with an area of 6.5 million km2 and 4357 Mha of global forest cover (Bastin et al. 2017). The combined effect of climate change and increase in human population will result in severe droughts, desertification, and land degradations in these ecosystems (Huang et al. 2012, 2016). This will further affect the productivity, biodiversity, soil fertility, and organic matter composition which in turn reduces their C storage and sequestration potential. Among the different abiotic factors, soil water availability is considered as a significant variable controlling the soil C storage in arid and semi-arid ecosystems (Meza et al. 2018). Management strategies focusing on the C sequestration by restoring the existing vegetation would be effective in mitigating climate change and its effects on these ecosystems (Malagnoux et al. 2007). To date, only a few studies on biomass and C pools have been carried out in these ecosystems (Bonino 2006; Wagner et al. 2015). According to good practice guidance developed by the Intergovernmental Panel on Climate Change (IPCC), the total C stock in any forest ecosystem is derived from aboveground biomass (AGB), belowground biomass (BGB) or roots, forest floor litter biomass (LB) or detritus pool, wood debris, and soil organic matter (SOM). Therefore, assessment of C stored in these different pools is crucial to develop a new conservation policy related to C sequestration and combat climate change. AGB and BGB are the living pools of C in forests, which contributes a significant amount of C to the terrestrial ecosystem (Eggleston et al. 2006). The LB contributes only a small fraction of C to the terrestrial pool and hence considered as a minor pool (Ravindranath and Ostwald 2008). The largest and very important C pool in the terrestrial ecosystem is SOM, which contains soil organic carbon (SOC) and plays a great role in the cycling of nutrients and C between the lithosphere and atmosphere (Lal 2005). C pools in various forest ecosystems are strongly influenced by temperature, rainfall, topography (Vayreda et al. 2012), forest type and structure (Wei et al. 2013), tree species composition (Hu et al. 2015), species diversity (Arasa-Gisbert et al. 2018), land use changes, and human-induced disturbances (Canadell et al. 2007). An estimation of the existing pools of C in different forest types is hence required in order to make necessary management strategies related to C sequestration and storage (Johnson and Kern 2002). Around 3.2 million km2, i.e., 12% of the geographical area, is covered by arid zones of India. In India, biomass and C stock has been reported for various ecosystems based on growing stock volume (GSV) data of forest inventories and appropriate conversion factor related to both biomass and C (Ravindranath et al. 1997; Lal and Singh 2000; Chhabra et al. 2002; Manhas et al. 2006; Sharma et al. 2010; Chaturvedi et al. 2011; Dar and Sundarapandian 2015; Salunkhe et al. 2018). However, most of these studies are limited to mainly tropical and temperate ecosystems of India and a very little information is available from semi-arid forests. Moreover, the urban ecosystem in urban areas plays a dynamic role in reducing air pollution and sequestration of atmospheric carbon dioxide (CO2) in their vegetation biomass and soils. Delhi, considered as one of the most polluted cities in the world, has a unique forest ecosystem located on ridges. The ridge areas are the extensions of Aravalli hills in Delhi with a length of 32 km and serve various ecological, environmental, and social functions. Delhi ridge has been notified as reserved forest, managed mainly with the objectives of increasing the forest cover, biodiversity, conservation by public participation, reduction in monoculture plantations, and encroachments. Both north and central ridge forests alone occupied almost 80% of the total forest area of Delhi. The growing urbanization has led to complete loss of the vegetation and only a few areas of the forests have been protected in Delhi. The regeneration of vegetation is further prevented due to excessive grazing and encroachments. Since it is very difficult to increase forest cover in such developed areas, the C sequestration potential of these forests can be enhanced by implementing some management strategies focusing on conservation of forests. However, there is a lack of information on biomass and C pools of this unique forest ecosystem in Delhi. Thus, the main aim of this study was to assess the above- and belowground pools of C in a semi-arid forest ecosystem of Delhi. The present study has the following objectives: (1) to estimate the C stock in different components (C pools) of a semi-arid forest ecosystem of Delhi, (2) to estimate the C allocation pattern in different pools, and (3) to analyze various factors influencing the C storage pattern in these components. The state of Delhi, comprising National Capital Territory (NCT), lies between 28°24′17“ N and 28° 53′ 00″ N latitudes and 76° 50′ 24″ E and 77° 24′ 17″ E longitudes and covers an area of 1483 km2. Physiogeographically, the area is dominated by river Yamuna, the Aravalli range, and the plains in between, formed by alluvium deposits of recent origin. About 25% of the total area of NCT is in rural and the remaining 75% is urban. As per Census India 2011, the population of Delhi is 16.8 million with a decadal growth of 21.21%. As per the Land Use Statistics, Ministry of Agriculture, Government of India (2013–2014), net sown area, current fallow, and culturable wasteland is 221.4, 119, and 98.9 km2 covering 15%, 8.07%, and 6.71% of its total geographical area, respectively. Forest’s land use covers 14.8 km2 with 1% of the total geographical area. A major chunk of land, i.e., 927 km2 representing 62.85%, is not available for agriculture. With rapid urbanization in Delhi, there is a continuous decrease in rural area and agricultural land. Delhi ridge which is the extension of Aravalli hills is estimated to be 2.4 billion years old. The ridge recorded a massive afforestation during nineteenth century and has been notified as reserved forests under the Indian Forest Act, 1927. However, due to rapid urbanization, there was a decrease in ridge forest area between 1920 and 1930. The ridge forest was, then again, declared as reserve forest in 1980 in order to limit the anthropogenic activities. At present, the recorded forest area of Delhi state is 102 km2, which constitute 6.88% of its geographical area, with reserve and protected forests comprising 76.48% and 23.52% of total forest area, respectively (FSI 2017). The forest type is tropical thorny forest (Champion and Seth 1968). The vegetation is mainly dominated by middle storied thorny trees with open patches having scattered distribution. The soil type on the ridge has been reported as sandy loam to loam (Chibbar 1985). Prosopis juliflora (Sw.) DC, an exotic species, is the dominant tree in the forest. Acacia nilotica (L.) Delile, Acacia leucophloea (Roxb.) Willd., Salvadora oleoides Decne, and Cassia fistula L. are among the commonly found native trees (Sinha 2014; Meena et al. 2016). The commonly growing shrubs in the forests are Justicia adhatoda L., Capparis sepiaria L., Carissa spinarum L., Jatropha gossypifolia L., and Opuntia dillenii L. Two sites were selected for this study, (1) north ridge forest (NRF) and (2) central ridge forest (CRF). The NRF has an area of 87 ha and situated at 28° 36′ latitudes and 77° 41′ E longitudes. The CRF has an area of 864 ha and situated at 28° 41′ latitudes and 77° 12′ E longitudes. The climate of the study area is semi-arid and characterized by hot-dry summers (April to June), monsoon (July to October) and cool-dry winters (November to January). The study area received a total annual precipitation of 720 mm with 31 and 19 °C as mean maximum and minimum air temperature during 2012 (IMD, 2012). About 87% of the total rain was received during the monsoon. The soil in the study sites are dry and sandy in nature. A total of 15 and 25 plots of 10 × 10 m were laid randomly in NRF and CRF sites respectively. The phytosociological data of the study sites were collected during August and September in the year 2012. All the trees with the diameter ≥ 10 cm DBH (1.37 m above from the base) occurring in each plot were measured and identified to the species level. All the trees were considered as individuals as per Knight (1975) and individuals with DBH < 10 cm were recorded as seedling/saplings (Pande et al. 1988). The phytosociological parameters were evaluated using the standard methods suggested by Misra (1968). Tree density (TD) was estimated by dividing the total number of individuals of a species with a total number of quadrats studied. The basal area (BA) of each tree was calculated as the ratio of CBH2 (squared circumference at breast height) to 4π. The total tree biomass (TB) (Mg ha−1) is described as the sum of AGB and BGB. The understory biomass, i.e., shrubs (woody species other than trees with less than 1 m height) and herbs, was estimated by randomly laying 5 × 5 m and 1 × 1 m quadrat for shrubs and herbs, respectively. The shrub biomass (SB) was estimated by harvesting method, where 10% of each species of shrub was harvested and fresh weight of the harvested sample was measured immediately with an electronic balance in the field. For the herbaceous biomass (HB), all the herbaceous vegetation falling in 1 × 1 m quadrat was harvested and fresh weight was measured immediately in the field. The representative samples of both herbs and shrubs were taken to the laboratory, where they were oven dried at 65 °C for 48 h. The dry weight of the sample was then estimated. The forest LB was estimated by collecting the litter at quarterly interval using specially designed plastic trays, laid randomly within 10 × 10 m quadrat and pooled for further analysis. The fresh weight of the litter (leaves and branches) was taken in the field. The representative samples were brought to the laboratory where the samples were oven dried at 65 °C for 48 h and subsequently the dry weight was measured. Soil samples were collected during the same period from each plot at two depths, i.e., 0–10 and 10–20 cm. The soil samples were collected randomly from three points from each plot and a composite was made. For SOC analysis, the soil samples were dried at 50 °C for 24 h and sieved through a 2-mm sieve. The sieved samples were further ground in a mortar with pestle and then analyzed using CHNS Analyzer (Elementar vario). where Kd is the depth of soil (cm), BD is the bulk density (g cm− 3), SOC (%) is soil organic carbon, and CF is a correction factor for coarse fragments (> 2-mm particles) (Borah et al. 2015). where C is the carbon concentration of the corresponding vegetation. Since it was difficult to separate the different components of the tree for C estimation, a universal coefficient of 0.475 was used for tree C estimation (Raghubanshi 1991; Singh and Chand 2012), indicating approximately 47.5% of C in dry plant biomass (Westlake 1963). The understory (shrubs and herbs) and forest LB was estimated to be 50% of the biomass (Dar and Sundarapandian 2015). The total ecosystem C was taken as the sum of C content in all the pools, i.e., AGB, BGB, SB, HB, LB, and SOC. All the statistical analyses were done using the SPSS software package (SPSS version 16, SPSS Inc., Chicago 1 L, USA). The independent t tests were performed to test the significant differences in TD, BA, AGTB, BGB, SB, HB, and C content between NRF and CRF. For SOC, the significance was tested between the two forest sites and at different depths among a forest. The significance was tested at p < 0.05. TD and BA in different DBH classes are shown in Fig. 1a and b, respectively. While the total TD was high in the CRF (684 individuals ha−1) than NRF (633 individuals ha−1), most of the trees in CRF are distributed in lower DBH classes. In NRF, the distribution of the trees on the basis of the DBH class was wider with comparatively higher TD in DBH above 60 cm. In both the sites, individuals within diameter class 11–20 cm were dominated with TD of 240 and 328 individuals ha−1 in NRF and CRF, respectively. The maximum BA was contributed by individuals in DBH class 31–40 cm (8.87 m2 ha−1) in NRF and 11–20 cm (6.08 m2 ha−1) in CRF site. The distribution of TB in different DBH classes is shown in Fig. 2c. The maximum biomass was observed for trees belonging to DBH class 11–20 cm in both NRF (24.25 Mg ha−1) and CRF (23.57 Mg ha−1). The species-wise contribution to the TB in both forests is given in Table 2. Highest contribution (~ 40%) was observed by P. juliflora, having maximum biomass at both sites (44.39 and 28.68 Mg ha−1 in NRF and CRF, respectively). The other associated tree species also contribute significantly to the total TB like Acacia leucophloea (18.31 and 11.55 Mg ha−1 in NRF and CRF, respectively), Pongamia pinnata (L.) Pierre (8.22 and 3.26 Mg ha−1 in NRF and CRF, respectively), and Azadirachta indica Juss. (6.72 and 3.12 Mg ha−1 in NRF and CRF, respectively). The biomass in the different components of the two different study sites is given in Table 3. The AGTB for NRF and CRF was estimated as 75.24 and 44.95 Mg ha−1 and BGB was 32.61 and 24.25 Mg ha−1, respectively (Table 3). The TB, AGTB, and BGB were significantly different between the two forest sites (p < 0.05). The understory biomass (shrubs and herbs) was 1.63 and 1.29 Mg ha−1 in NRF and CRF, with a mean of 1.46 Mg ha−1. The SB was estimated to be 1.15 and 0.80 Mg ha−1 in NRF and CRF, with a mean of 0.98 Mg ha−1. The HB ranged from 0.48 to 0.49 Mg ha−1 in NRF and CRF, with a mean of 0.49 Mg ha−1. However, we did not find a significant difference (p > 0.05) for the biomass of SB and HB between the two forests. The forest LB was significantly higher in CRF (0.64 Mg ha−1) as compared to NRF (0.40 Mg ha−1), with the mean of 0.52 Mg ha−1. The C content in different compartments (pools) in both forests is given in Table 4 and the pattern of allocation is shown in Fig. 2. Maximum C allocation was observed in AGB pool (sum of AGTB, SB, and HB) contributing 49.02 and 40.54% in NRF and CRF, respectively, to the total forest C stock. This was followed by SOC pool, with an allocation of 29.93 and 37.7% in NRF and CRF, respectively. BGB contributed 20.77 and 21.26% of C in NRF and CRF, respectively, followed by LB with an allocation of 0.27 and 0.59% of C in NRF and CRF, respectively. Within the selected forest sites, the C storage was found to be high in AGB (36.56 Mg C ha−1), BGB (15.49 Mg C ha−1), and SOC (74.57 Mg C ha−1), pools in NRF than CRF, whereas the C storage in the LB was high in CRF (0.32 Mg C ha−1) as compared to NRF (0.2 Mg C ha−1). SOC was found to be high in upper (0–10 cm) as compared to lower soil layers (10–20 cm) in both forest sites (Table 5). The SOC stock at 0–10-cm depth was estimated to be 26.60 and 24.36 Mg C ha−1 in NRF and CRF sites, respectively. The SOC stock at 10–20-cm depth was estimated to be 18.04 and 16.50 Mg C ha−1 in NRF and CRF sites, respectively. The mean SOC stock from 0 to 20-cm depth was estimated to be 22.32 and 20.43 Mg C ha−1 for NRF and CRF sites, respectively. The SOC stock both in 0–10 and 10–20 cm depth did not vary significantly (p > 0.05) between the two forest sites. Furthermore, no significant differences (p > 0.05) were observed in SOC stock between two depths in NRF forest sites. However, in CRF site, the SOC stock between two depths varied significantly (p < 0.05). 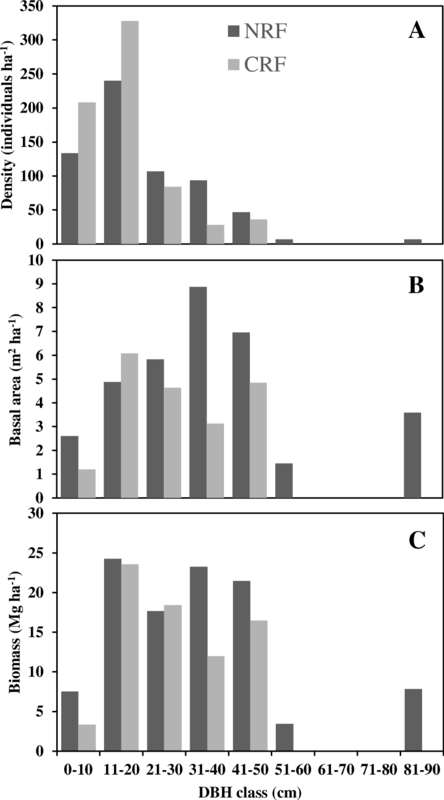 The estimated total biomass of the forest sites range between 71.13 and 109.88 Mg ha−1, with an average of 90.51 Mg ha−1, within the range reported for Indian forest systems (27.4 to 251.8 Mg ha−1) (Chhabra et al. 2002), but is higher than the average (40 Mg ha−1) value reported for thorn forest system (Ravindranath et al. 1997). This clearly shows that the studied forest system in Delhi has the potential to store more C in its plant biomass. The C stored in different pools was estimated as aboveground (29.28 Mg C ha−1), roots or belowground (12.59 Mg C ha−1), litter (0.26 Mg C ha−1), and SOC (21.36 Mg C ha−1). The estimated average forest standing biomass C (sum of AGB and BGB), i.e., 41.87 Mg C ha−1, was lower than the values reported for tropical dry forests of Asia (Gibbs et al. 2007; IPCC 2006) and forests from Mexico (Dai et al. 2014) and Ethiopia (Solomon et al. 2017, 2018), but higher than forests from Africa (Gibbs et al. 2007; IPCC 2006) and Brazil (Júnior et al. 2016). Carbon in AGB was also lower than that of a semi-arid (Picea crassifolia) forest in the North Eastern Tibet (Wagner et al. 2015). The mean standing biomass C for the present forests is within the range reported for tropical dry deciduous (12.79–62.48 Mg C ha−1) and evergreen forests (18.85–48.58 Mg C ha−1) but higher than tropical thorn forests (4.91–13.3 Mg C ha−1) from India (FSI 2017) (Table 6). Tree species composition also affects the total biomass and C stock of forest (Yang et al. 2005; Borah et al. 2015; Solomon et al. 2017). In the present study, P. juliflora was found to be the most dominant tree species in both forest sites, having the highest TD, BA (Meena et al. 2016), biomass, and C stock. However, the other associated tree species like Holoptelea integrifolia, Acacia leucophloea, Acacia nilotica, Azadirachta indica, Syzygium cumini, Pongamia pinnata, and Albizia lebbeck, though having a low TD, contribute significantly to the total biomass in NRF site. High tree species diversity in NRF than CRF further indicates its effect on forest productivity, increased biomass, and C stock. 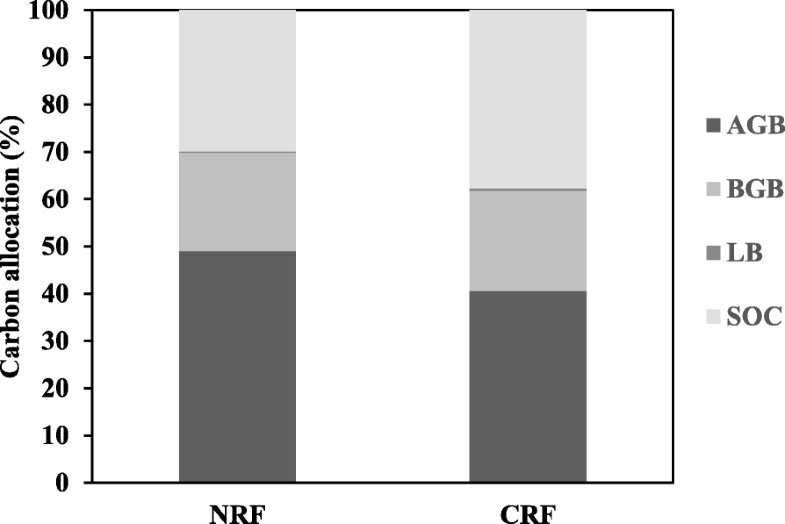 Management interventions and increased soil moisture content in NRF than in CRF promote the establishment of different species (Meena et al. 2016). Additionally, differences in TD may also contribute to differences in C density among the forest types (Baker et al. 2004; Behera et al. 2017). BGB/AGB ratio indicates the biomass allocation and stability. A high ratio was observed for species like Bauhinia purpurea (0.64), Cassia fistula (0.62), Acacia modesta (0.58), and Butea monosperma (0.62) in these forests. Furthermore, a higher ratio for P. juliflora in CRF (0.7) than in NRF (0.45) suggested a deep rooting system allowing more penetration and establishment in dry areas. The low ratio in NRF (0.43) than in CRF (0.54) indicated trees with a shallow rooting system, which easily uprooted by the wind. Furthermore, the higher investment to BGB in CRF than in NRF could be due to lower water tables in CRF. The significant role of understory pool (shrubs and herbs) in C sequestration and maintaining the biodiversity of the forest necessitates its estimation in C stock studies (Hou et al. 2015; Yue et al. 2018). The contribution of understory (shrubs and herbs) C storage to total forest C ranges between 1.09–2.02%, which is within the values (3%) as reported by Brown et al. (1997). However, the allocation of understory biomass is high when compared to the other forests of India, i.e., 0.13% in temperate forests of Kashmir (Dar and Sundarapandian 2015), 0.15% in the humid tropics in the Northeast (Baishya and Barik 2011), 0.1–0.3% in spruce forests in Northwest China (Yue et al. 2018), and also with similar forest type of Picea crassifolia forests (0.4%) in the Qilian Mountains (northeastern Tibetan Plateau) (Wagner et al. 2015). The difference in the understory pool of the arid zone could be attributed to species composition, canopy cover, nutrients, and light (Abdallah and Chaieb 2012). As the studied forest is an open forest covering 8.09% of the total forest cover (11.88%), the lower TD favors the growth of ground vegetation, which subsequently increases the biomass and C storage in this pool. Forest floor litter represents the detritus C considered as the most active pool in the forest C cycle (Yanai et al. 2003). The contribution of C in LB pool to the total C stock is smaller (0.2–1%) as compared to other components but is quite significant (FAO 2005). The estimated litter C is within the range reported for the tropical thorn forest of India (FSI 2017). The contribution of forest litter pool was similar or close to the values reported for different forest types by Baishya and Barik (2011) (0.5%); Zhang et al. (2013) (2–4%); Dar and Sundarapandian (2015) (2.06%), and from a similar forest type by Wagner et al. (2015) (0.9%). The amount of litter C is controlled by various factors like age and density of trees (Yue et al. 2018), soil nutrient levels (Ovington 1956), species composition, quantity and quality of annual litter input (Zhang and Wang 2010), decomposition rate (Chaturvedi and Singh 1987; Taylor et al. 2007), anthropogenic disturbances, and management history. The average SOC stock for the forest up to 20-cm depth was estimated as 21.36 Mg ha−1. These values were lower than those reported for tropical dry deciduous forests (37.5 Mg ha−1 for 50 cm, Chhabra et al. 2003), southern thorn forest of India (76.85 Mg ha−1, Ramachandran et al. 2007), forests of Kolli hills of Tamil Nadu (175–369 Mg ha−1, Mohanraj et al. 2011), tropical dry forest of Brazil (47.73–61.6 Mg ha−1, Santos et al. 2016), and a semi-arid thicket of South Africa (168 Mg ha−1, Mills et al. 2005). However, these estimated SOC values are comparable to those reported for other tropical dry forests of India at 0–30-cm depth for Sathnur reserve forest (16.92–44.65 Mg ha−1, Gandhi and Sundarapandian 2017), Uttar Pradesh (21.8 Mg ha−1, Chaturvedi et al. 2011), thorn forest of India (19.43–30.17 Mg ha−1, FSI 2017), and also with tropical dry forest of Australia (29.98 Mg ha−1, Gray et al. 2015). The amount of SOC content is determined by the rate of organic matter inputs, accumulation, rate of mineralization in different organic C pools (Post and Kwon 2000), stand type, and stand age (Cao et al. 2018). The overall contribution of SOC to total forest C stock was found to be 29–38%. The reduced SOC concentrations in the present forest type probably result from the high lignin-containing litter from P. juliflora and other associated semi-arid trees and low soil moisture content which limits the soil microbial activity and decomposition of organic matter (Wagner et al. 2015; Yue et al. 2018). The rate of litter decomposition also significantly control the SOC stock in a forest. Exposure to high solar radiations in the semi-arid ecosystems results in loss of litter mass and C via altering the rate of litter decomposition (Zhang et al. 2008). UV exposure along with interannual variability in precipitation changes the foliar traits and litter chemistry by causing photodegradation of lignin and C, hence affecting the overall litter decomposition in these ecosystems (Gaxiola and Armesto 2015). Over the years, the studied forests are influenced by anthropogenic disturbances including encroachments, resource exploitation, construction, deforestation, overgrazing, exotic plantation, and urbanization which resulted in forest fragmentation and have altered the forest structure and species composition (Sinha 2014). This has serious impacts on future biomass and C storage potential of these forests (Pan et al. 2011). A similar study by Muhati et al. 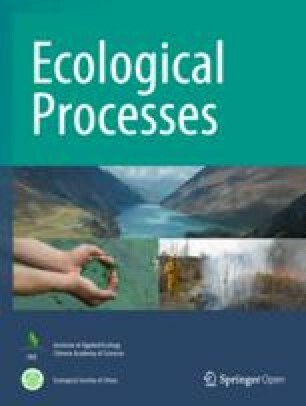 (2018) in a sub-humid disturbed montane forest of Kenya reported decreased values of AGB than indigenous dry tropical forests, which was suggested due to the dominance of young trees having low BA and height, a characteristic of a regenerating forest. In our study, lower values of C in AGB could be attributed to a high TD of individuals belonging to lower DBH classes. However, the presence of more trees in higher DBH classes has significantly increased the biomass in NRF as compared to CRF, indicating the importance of mature trees in C storage in a forest. The contribution of large trees (DBH > 70 cm) to AGB in the forest was reported up to 50% in previous studies (Brown and Lugo 1992; Brown et al. 1996; Clark and Clark 1996; Baishya et al. 2009). Therefore, the increased volume of mature trees has made a noteworthy contribution to total AGB and C sequestration in NRF site as observed in other studies (Stephenson et al. 2014; Kauppi et al. 2015; Behera et al. 2017). The C stock of tree species correlates positively with BA, TD, diversity, and forest productivity (Baishya et al. 2009; Borah et al. 2015; Joshi and Dhyani 2018). Furthermore, the age of forest stand also influences the biomass and correlates positively with forest C stock in previous studies, indicating an increase in C storage with stand age (Wei et al. 2013; Köhl et al. 2017). The older stand age of these forests results in temporal net primary productivity (NPP) accumulation and increases the overall tree C storage (Chen et al. 2016). Overall, our study shows that the living portions (AGB + BGB) of the mature and young trees in the studied forest ecosystem in Delhi could play a significant role in the storage of more C in their plant biomass than soils. The SOC pool significantly increases the total C stock in such forest types and therefore has the potential for C sequestration. The study also emphasized the minor pools of C in the forest, i.e., the understory C pool and detritus pool which although have a small but significant contribution to the total C stock in the studied forest. The study estimated the C content in different pools in a semi-arid forest ecosystem in Delhi, in order to understand their allocation and C sequestration potential. Our study estimated maximum storage of C in plant biomass contributing 40–49% of the total forest C stock suggesting it as a great potential pool of C storage in these forests. Furthermore, it was found that the C storage potential in the forests is influenced by tree basal area, density, and species composition. Maximum biomass contribution by trees in lower DBH classes revealed the importance of young trees as major sinks of C in these forests. However, our results emphasize the protection of old-growth mature tree species having low TD but high BA as these are under the threat of extinction. In the present forest, P. juliflora, being the most dominant tree species, adapts better to moisture stress condition and showed highest biomass and C storage. However, attention should be given for the conservation of other native tree species like Acacia leucophloea, Acacia nilotica, and Albizia lebbeck showing high storage of biomass and C. The study also focuses on SOC pool contributing 29–38% to total C stock of forest, which suggests it as a potential sink in C sequestration. The minor pools (LB) also contribute significantly to the total C storage in these forests and therefore should be considered in C stock studies. The studied semi-arid forest is notified as reserved forest, but over the years, forest destruction for construction and expansion leads to the loss of indigenous trees. The C stock studies are difficult in such areas as the forests have more fragmented patches resulting in greater uncertainty and difficulty in estimation of tree biomass. Our study shows the importance of semi-arid areas in C stock and provides necessary data to the researchers and forest managers for developing management plans in arid and semi-arid forests of India. Authors thankfully acknowledge the Council of Scientific and Industrial Research (CSIR), University Grants Commission (UGC) (UGC-DSK-PDF (BSR)/BL/16-17/0146) and Department of Science and Technology (DST), India for financial support. We also thanks University of Delhi for providing Research and Development for providing grant for doctoral research program. AM proposed the idea and conducted the field sampling, data collection, laboratory analysis, data interpretation, and manuscript writing. AB and MH carried out field sampling and data collection. JD helped in the analysis of data and edited the manuscript. KSR guided the study, interpreted the results, and critically reviewed the idea. All authors read and approved the final manuscript.